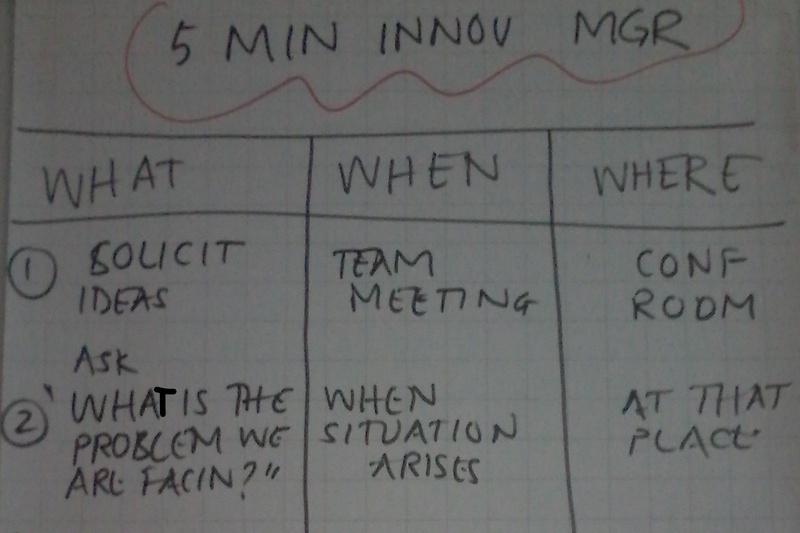 In my innovation workshops with managers, one challenge that shows up consistently is that of “no time”. Managers genuinely feel that their plate is full and they find it difficult to get time to do additional activities that might enable innovation in their teams. As a response to this situation, I started facilitating a short exercise a few years back which I call “Five minutes innovation manager”. The idea of this exercise is to suggest that you don’t have to dedicate a lot of time for innovation, just five minutes a week is enough. There are always a few participants in each session for whom this is the key takeaway. 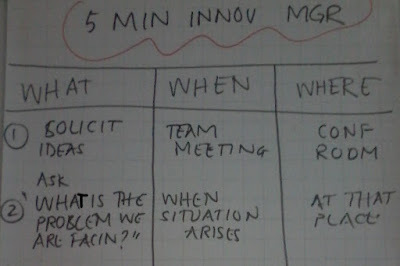 What can you do in five minutes to enable innovation? Let’s explore in this article. 1. Publicize a challenge-book: One of the most effective interventions is to identify your team’s topmost challenge and write it in a prominent place – say the whiteboard in your office, the wall in your corridor, or the intranet page of your team. And do nothing else. A challenge which gets due attention has a life of its own. You can also solicit challenges from your team members which you can collate and publicize. 3. Solicit ideas: In your weekly team meeting, you can dedicate five minutes for brainstorming on a specific challenge. You will be surprised how many ideas get generated in five minutes. 4. Appreciate the effort: It doesn’t take much time to mention in the team meeting that you appreciate a prototype built (or demo shown) by one of the team members or a blog or white paper written by someone. It can send a subtle message that these activities are appreciated. You might think that activities like these done in five minutes may not make much of a difference. But you won’t know this until you try. Once you realize that it is not so difficult and doesn’t eat too much of your bandwidth, you may extend the time. This method is inspired by a chapter called “Shrink the change” in the book “Switch” by Chip and Dan Heath. The Heath brothers give several examples to illustrate that a five minute regime can go a long way bringing about a change. Why don’t you give it a shot and see? Prof. Edgar Schein’s book “Process consulting” was published in the year I was born – 1969. Since then he has been refining the concept over the past five decades. I have found the concept very helpful in my consulting career. In fact, I have read all of Schein’s subsequent books in “processing consulting” series – Process consultation revisited (1999), Helping (2009) and Humble Inquiry (2013). 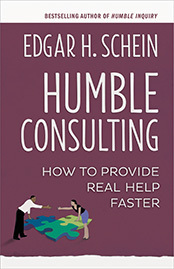 The latest entry from this series is “Humbleconsulting: How to provide real help faster” published by Berret-Koehler Publishers (2016). Here are 3 of my take-aways from “Humble consulting”. Humble questions may result in big impact: One of the key points Schein drives here is that carrying a humble attitude (being curious) towards the client is important in the helping process. And even a simple humble inquiry may lead to a big impact for the client. Here is an example Schein gives from his personal experience. Schein was having lunch with the CEO and his executive team of Alcoa Australia. The CEO pointed out that the VP Administration is retiring and proposed if Steve could be his replacement. VP Finance, VP Operations and a few others said that they were not comfortable with Steve as VP Admin but they were not able to point out the exact issue. At this point, Schein intervened and asked, “Sorry for jumping into the conversation, but I am curious what VP of Admin does.” CEO said that VP Admin heads a bunch of functions such as HR, internal accounting and finance and public relations. At this point, a VP jumped in to point out that Steve won’t be able to handle public relations. Others agreed. So another VP proposed that public relations could be separated from the VP Admin function and a new VP of Environmental Affairs and PR can be created. Everybody was comfortable with this idea and the issue was resolved. The point of this story is that Schein’s humble enquiry on the role of VP Admin led to a workable solution. Beware of content seduction trap: Schein says, “The consultant must have empathy but carefully avoid content seduction because, as an outsider, he will never have the insider’s direct knowledge of what will and will not work in the client’s culture”. Empathy is understanding the client’s situation while content seduction is a feeling that I understand the client enough and can suggest a workable solution. This looks at odds with the traditional consulting wisdom which says that an expert consultant should be able to provide a workable solution to his client. Schein cites several examples where he and other consultants conducted several interviews with the client executives, formulated a problem and devised a solution. When the solution was presented to the client, he either ignored it or rejected it outright. If proposing a solution is not a good approach, what does a humble consultant do? Well, Schein suggests using adaptive moves which will help client diagnose the problem as well as see a solution. Adaptive moves for simultaneous diagnosis and intervention: To understand the philosophy behind an adaptive move, it helps to understand following profound statement from Schein: There are no “real” problems, only a set of worries. Here, Schein questions the existence of problems as objective reality independent of client. According to him, a problem exists only as a set of worries in clients’ mind. Perhaps the client himself may be unaware of the real worry. A small step one can take in order for the client to see his real worry is what Schein calls an adaptive move. Let’s illustrate this using one of the examples Schein cites. He was trying to help a bunch of smart engineers at DEC in strategy meetings. The engineers were argumentative and would often interrupt each other and shoot down others’ ideas. Schein made several attempts to bring this unruly behaviour to their notice which they acknowledged but continued to behave as before. At one point, Schein got up, went to the flip chart board and started jotting down the ideas that were being discussed. While writing down an idea, if a person got interrupted, Schein would excuse the group and request the person to finish his idea so that he could write it down on the flip chart. That made sure all the ideas were captured and the group thanked Schein for being really helpful. It was a small gesture, but it solved the real concern in the minds of the engineers of losing out on ideas. What Schein originally thought to be the real problem – unruly behaviour – was not a worry as far as the group of engineers was concerned. 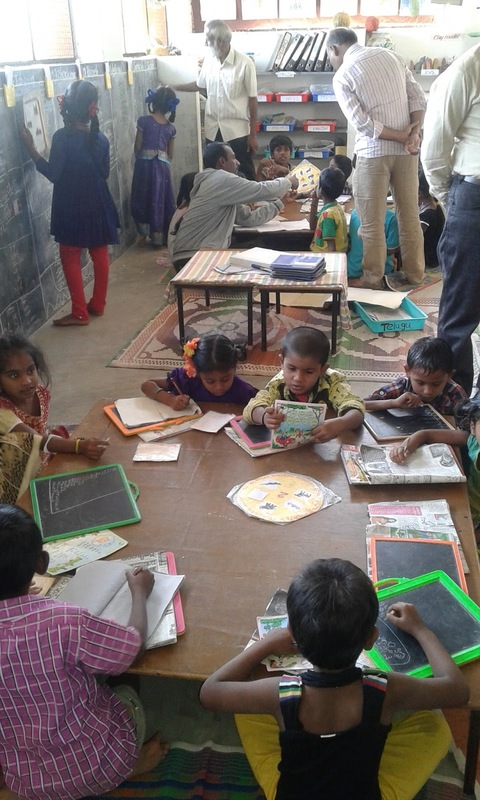 Subsequently, other group members began to go to the flip chart and learnt to do similar facilitation themselves. 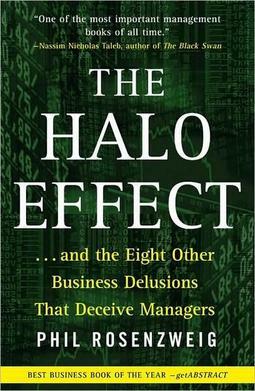 Schein uses 25 cases from his personal experience to illustrate the principles. In addition to presenting the conversation between him and his client, Schein also gives what went on in his mind, something like a mental commentary, before he replies to the client. I found this style very helpful. I am amazed by Schein’s productivity at the ripe age of 87 and wish him many more creative years! As a Design Thinking facilitator one of the key challenges I face is following: How do we create an experiential understanding of the concept of empathy? Participants do go through observations, interviews etc. However, how does one know if one is actually empathizing with the other? In this article, I am proposing a way of looking at empathy that might help in answering this question. The key is to understand empathizing as a process of accessing our own ignorance. What does “accessing ignorance” mean? And, what are the types of ignorance we need to access? Let’s explore in this article. Accessing ignorance: After an hour of field research, a group of participants returned to the training room. 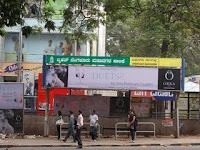 The team had visited a nearby bus stop and were eager to share their findings. A team member explained how people are in a hurry to reach home and can hardly wait for the bus to come to a full stop before jumping into it. I asked him how many people he interviewed. He said he didn’t have to interview anybody because he is a bus commuter himself and knows their pain. This anecdote illustrates what it means to not access ignorance. Every situation can be approached with one of two attitudes – that of knowing or that of ignorance. 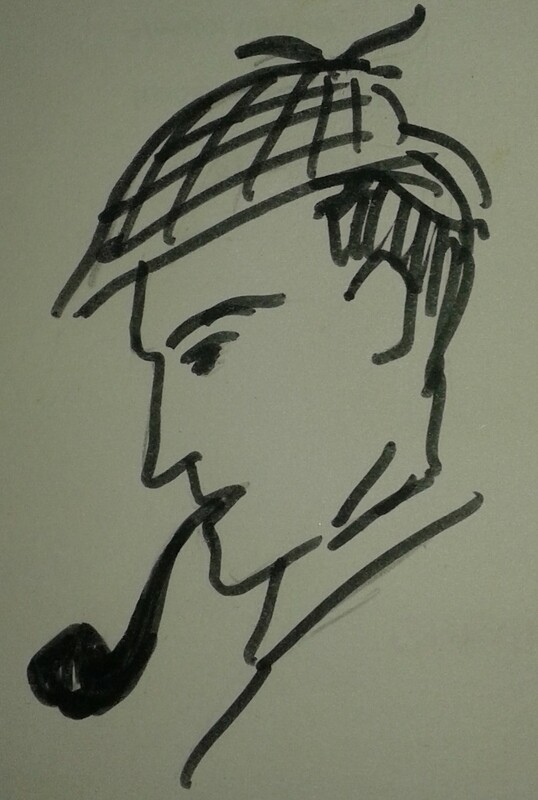 The gentleman in the bus stop team, approached the empathy exercise from the attitude of “knowing”. Empathy demands that we approach a situation from the position of ignorance. There are three kinds of ignorance that need to be accessed: content, intent and illusion. Let’s look at them briefly. 1. Content ignorance: If one needs to understand more about bus commuters, one needs to ask questions like: Where do people travel to? How long do they have to wait for the bus? How long is the typical journey? How frequently do they use a bus? When do they typically travel? Etc. Answers to these questions begin to create a better picture about the bus commuters’ situation. This is what I refer to as “content ignorance”. If this conversation builds some trust and openness, it may help us access the next level of ignorance: intent ignorance. 2. Intent ignorance: This ignorance is related to the anxieties and aspirations of people. Why do they travel by bus? Is it because they don’t like driving or is it because they can’t afford a car yet? Is it the long commute time that makes them anxious? Or is it the time taken away from family? Do people ever enjoy a commute? If so, under what circumstances? In short, intent ignorance tries to understand the emotional triggers and the intents that drive people to take up or not take up certain actions. Unless there is a level of trust and openness, a person may not reveal his anxieties and aspirations. For example, an auto drive may not tell you that his school going son is still ashamed of the fact that his father drives an auto. In short, if you are interested in learning to empathize, you should learn to approach a situation from the position of ignorance rather than that of knowledge. There are three kinds of ignorance that need to be accessed: content, intent and illusion. I first read the term “accessing ignorance” in Edgar Schien’s book “Humble inquiry”. Before we get into how to build these prototypes, it helps to clarify what I mean by a prototype. I like the Wikipedia definition of a prototype: A prototype is an early sample, model, or release of a product built to test a concept or process or to act as a thing to be replicated or learned from. 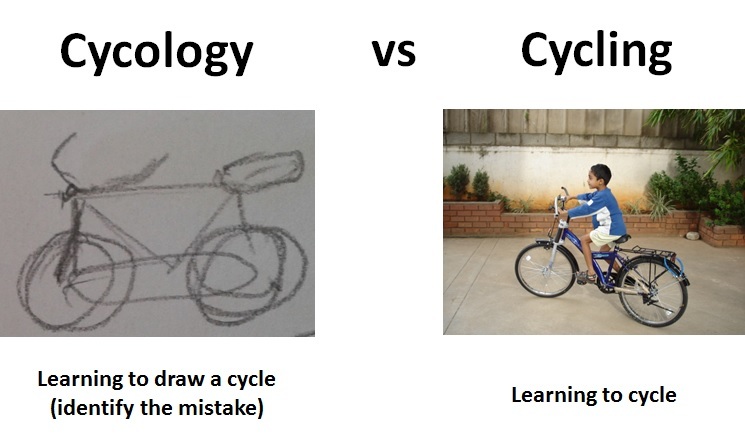 In the early phase of an idea, the primary purpose of a prototype is learning – which assumptions make sense, which ones don’t. There are three types of prototypes: looks-like (user interface), feels-like (experience sample) and works like (working model). Each type of prototype has a 1-hr, 1-day and 1-week version. Let’s see in brief below. 1-hour prototypes: One of the simplest types of prototype is a before-and-after storyboard. It is a feels-like prototype. This storyboard is similar in spirit with the before-and-after ads on weight-loss or hair-gain programs – one picture of “before” and one picture of “after” scenario. A before-and-after storyboard depicts a scenario before the idea is implemented and a scenario after the idea is implemented. I have seen that once a storyboard is created with sufficient details, it creates a lot of discussion. People have a lot more things to say about your idea by seeing a storyboard than reading just a few lines of text. I have seen companies like Intuit have studios where storyboards are put up on the walls and you can take a walk around to see what you like. Apart from a storyboard, we can also create wireframes – “looks-like” prototypes – in an hour. These wireframes can be created using paper and pen or even on PowerPoint. When built using cardboard or thermacol, they can also give a feeling of holding a phone in hand. A works-like prototype may not be always possible to build in an hour. However, the skill here is to identify a small part of the solution and see if it can be built using basic / used components. For example, if your idea is to start a fresh menu fast-food restaurant, then going to kitchen and making a plate using fresh food items could be a 1-hour prototype. For an automation idea, it may be writing a rudimentary script that shows how a manual task can be automated. If your idea is to give Uber like experience for local buses e.g. BMTC or BEST then you can show the Uber App and explain that you might use a similar technology (tools, algorithms) for buses. The important thing for works-like prototype is some knowledge of the working of the solution. 1-day prototype: “How long do you think it would take to make the first working version of Google Glass experience?” asks Tom Chi in this TED talk video. The answer is – 1 day. It had used components like a coat hanger, a netbook, a pico projector. It was a feels-like prototype but also involved bits-and-pieces of working models. A feels-like prototype can also be created by doing a 2-act skit which shows before-and-after scenario for your idea. Looks-like prototype can include wireframes made through PowerPoint or using your favourite wireframe tool. In 1-day you can make multiple wireframes – each corresponding to a key scenario. The picture above shows an ice-cream scoop made by Prof. Karl Ulrich using a used baseball bat and it was made in a few hours (see this article for more details). The 1-day works-like prototype shown above is a games-room designed in a student hostel at IIM in order to help students relieve their stress. Note that Gmail’s AdSense prototype was built overnight and even James Watt built the first working prototype of his steam engine in 3 days. 1-week prototype: Prof. Ulrich who designed 2-3 sample ice-cream scoops in 1-day, got one of them 3-D printed in a week’s time (see picture above). You can create a short video depicting the experience of your solution within 1 week. The picture above shows a scooter modified using tent-wires to give protection from rain for the rider. This was done as a student project in less than a week. 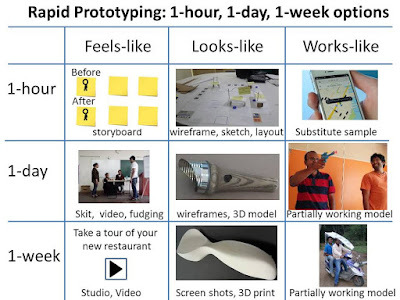 In short, rapid prototyping can happen as rapidly as an hour. Of course, a lab or a studio / workshop helps speed up prototyping. 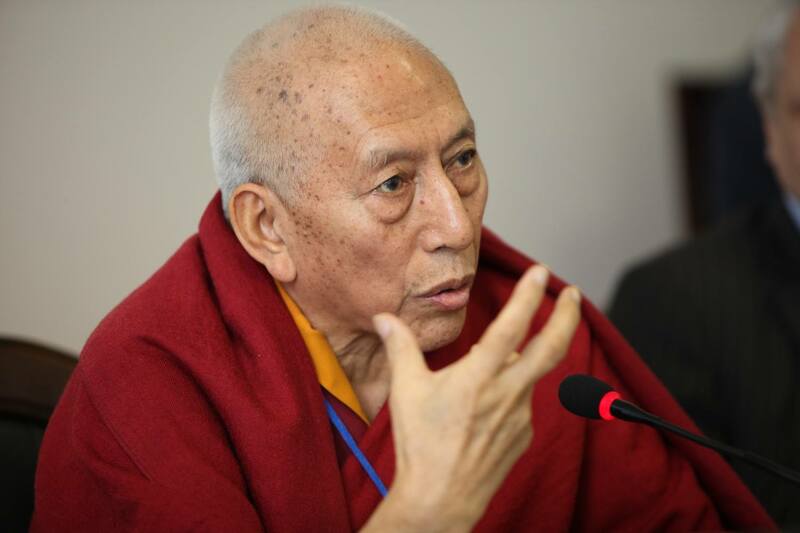 Meditators do years of practice so that they can live in the present moment. Henry Molaison for most of his adult life had no choice but to live in the present moment. As a person with amnesia since the age of 27, he had no concept of yesterday and tomorrow. When asked, “What will you do tomorrow?” Henry answered, “Whatever is beneficial.” Henry Molaison also known as H.M. through the psychology textbooks and literature is the most studied subject in the history of neuroscience. The book “Permanent present tense” by Prof. Suzanne Corkin of MIT whose lab studied Henry as a subject for over 40 years, captures the story of both Henry as well as the neuroscience of memory. I first heard of Henry when I watched the second episode of the six part PBS documentary “The brain with David Eagleman” titled “What makes me?” Henry underwent a brain surgery at the age of 27 in 1953 as the last option for his sever epilepsy. The surgeon removed both the sides of his hippocampus – a 3 cm component buried deep inside each side of our brain. Henry recovered from his epilepsy but the surgery took away his ability to form long term memories. If you walked out of a meeting with Henry and returned after a few minutes, Henry would greet you as though he is meeting you for the first time. In fact, when researcher Morris left and re-entered the room after some time, Henry said after greeting him, “There’s an empty chair. You go sit there.” That was, of course, the same chair Morris was sitting before he left the room. While being amnesiac Henry was intelligent, articulate and perceptive. Did Henry lose all types of long term memory? No. 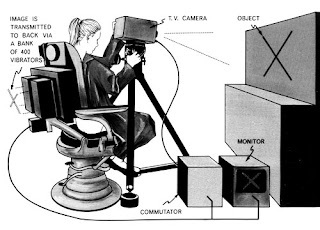 One of the breakthrough results in understanding long term memory happened when researcher Brenda Milner administered the star tracing experiment with Henry as the subject in 1963. The procedure involved tracing a five point star by looking in the mirror and it was done multiple times over three consecutive days. The task was challenging and involved learning a new motor-skill allowing a reversed visual image to guide the movement of the hand. Every time Henry began the experiment he had no memory of the previous try. However, Henry’s error rate kept dropping as the first day progressed. His error rate at the start of day-2 was similar to where he left off on day-1. On the third day, He performed nearly perfectly, his pencil rarely crossing the boundary. On day-3, after one of the trials Henry observed, “Well, this is strange. I thought that that would be difficult, but it seems as though I’ve done it quite well”. This showed that Henry hadn’t lost all types of long term memory formation. He had lost what we call episodic memory (What did I eat for breakfast this morning? And with whom?) and semantic memory (What are the names of my friends? Knowledge of people, places). However, he had retained procedural memory (How to use a walker, remote, joystick etc.) When Henry passed away in 2008, he had been using a walker for over a decade. Henry was mostly an “amiable, smiling” man, but did he ever get upset? Occasionally, he did get frustrated, sad, aggressive or uneasy but these negative emotions would typically dissipate as soon as he was distracted. 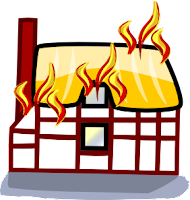 There were no new associations getting formed that were binding the incident or person or object to an emotion. Perhaps there lies a clue to human suffering – storing a connection between an external situation or person with a negative emotion in the long term memory. We can carry anger or guilt for years and retrieve it as soon as the link is activated. 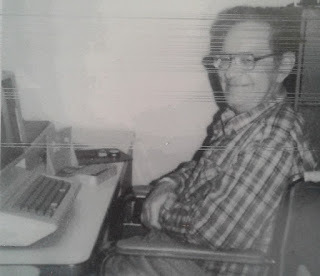 Henry’s story prompts us to pay attention as we form and retrieve these links every day. After Henry passed away his brain was scanned in an MRI machine for nine hours. Later it was cut into 2401 ultrathin slices from front to back. These slices have been digitized and assembled into a three-dimensional image that scientists and the public will be eventually view on the web. I liked the way Prof. Corkin concludes the book – Although he lived his own life in the present tense, Henry had a permanent impact on the science of memory, and on the thousands of patients who have benefited from his contributions. 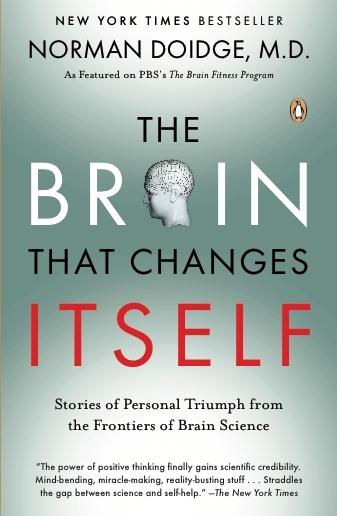 I recommend the book to anyone wanting to understand the development of neuroscience of memory, how experiments are designed in neuropsychology and the role memory plays in our day-to-day life as well as building a narrative called “I”. 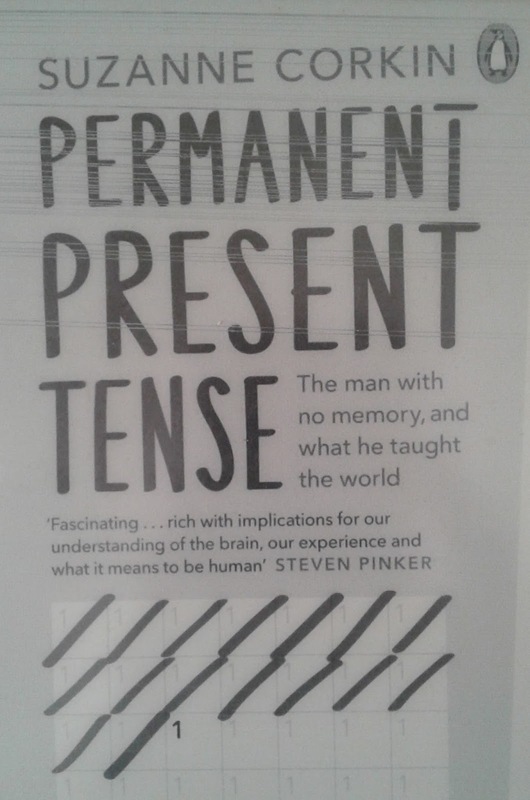 “Permanent present tense: The man with no memory, and what taught the world” by Suzanne Corkin, Penguin, 2013. 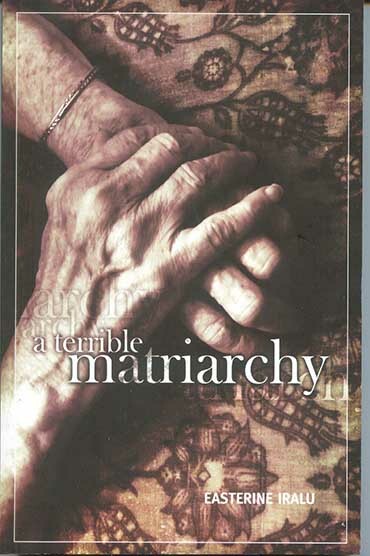 Book cover, Henry’s picture are from the book “Permanent present tense”. 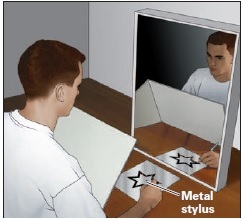 Mirror tracing image is from Psychology textbook by Peter Gray. “Unfolding Meaning” is an edited transcript of a weekend dialogue with David Bohm that occurred in May 1984 in a small country hotel in England. It is similar in spirit with the other seminar Bohm held in Ojai in 1991 and is published as a book “Thought as a system”. However, it is very different in its content especially the dominant metaphors used to communicate the abstract and subtle aspects of our true nature. In this article we look at the 4 metaphors from the book which appealed to me and what they mean. Thought as a source and the simulation of a program: This is the most dominant metaphor Bohm uses throughout the book. Every thought we have gets stored as a program in a peculiar sort of encrypted form. Unfortunately, our brain doesn’t have the capacity to see that the thought made a program and its subsequent actions are determined largely by that program. Thought is a program that is programmed to conceal itself. 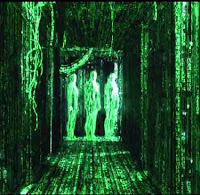 When we are thinking, the results of the simulation shows up in the body (hormonal changes, blood pressure, heart beat etc.) and the emotions (anxiety, anger, happiness) but the connection between that and the thought is concealed. In fact, thought attributes the actions of the program to the ‘self’ – a mistake. Bohm says – the attempt to watch one’s own programs is the beginning of a kind of meditation. 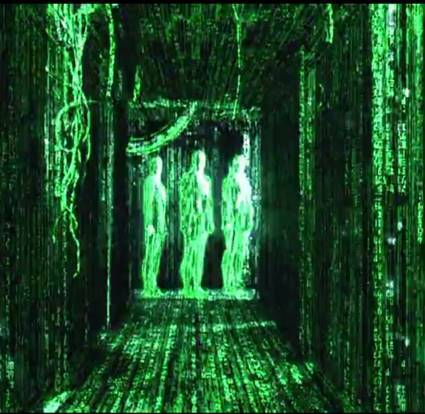 The picture on the side is from the movie "The Matrix" at a point when the protagonist Neo, for the first time, begins to see the world as a simulation of a program. Why do I still kick the cat? One of the participants observed, “You can get excited about things like this and then go home and still kick the cat.” Bohm replied, “Why shouldn’t you kick the cat?” If one were really cruel then one would kick the cat and not bother about how it hurt the cat. For those of us who regret the act later, there must be a tacit connection between the cat and oneself. Then the question is – how to see the connection even before I kick the cat? Bohm suggests that it requires attention to your thoughts. When you feel the impulse to kick the cat, you should suspend that impulse. And then you should attentively watch the thought behind it. The thought could be that of frustration (boss shouted at me) or something is not working out (I am doomed). 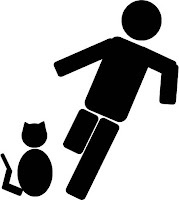 Whatever it is, one should follow that thought and see how it triggers the program of “kicking the cat” automatically. 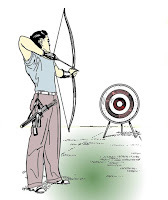 What to do when I miss the mark: Suppose I am an archer and I miss the mark and I say some evil spirit made me miss the mark. That would never get me anywhere. You have to be attentive as you practice to how you are missing the mark. If you don’t do that then you won’t learn. Every time we have sustained fear or worry or anxiety, it is similar to an archer missing the mark. 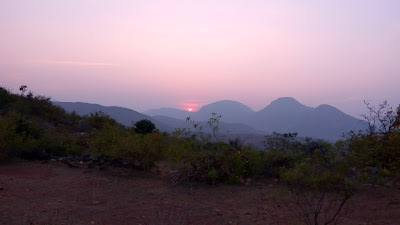 At that time, if we identify a situation or a person as the cause then it is an incorrect attribution like identifying evil spirit as the cause. Instead what we need is to pay attention to the program that is getting triggered by some thought. Seeing beyond Las Vegas lights: Why don’t we see the vastness beyond the world of thoughts? Bohm says following: If you go to a place like Reno, Nevada or Las Vegas and we turn on all these electric lights then you don’t see the stars, and you say that all these lights are the main thing. And there is no universe. They blot out the universe. So when you turn off the lights, then the universe comes through. At first, it seems something very faint, but that faint thing may represent something immense, whereas the very powerful bright thing may represent nothing much. In short, every thought we have makes or adds to a program which, in turn, determines our subsequent actions. When we kick the cat or when we miss the mark, it is the program that is in action. And we are mostly unaware of it. We are so lost in the thought-world that it blinds us like the lights of Las Vegas. Only when the “lights” are off, do we see the vastness beyond thought-world. When we pay attention to the program in action, it is a kind of meditation.